At Sea Brite Dental, we provide all of our young patients with a pain-free, no-stress dental experience that will keep them coming back because they have fun in our office. 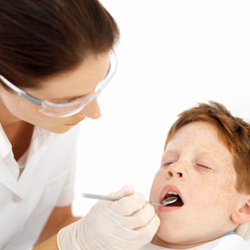 This includes pain management for dental procedures, when necessary, to keep your child comfortable and relaxed. Here is a list of our most commonly asked questions along with our answers. If you require more detailed answers or have other concerns about pediatric pain management during dental procedures, please give us a call. At Sea Brite Dental, we usually use nitrous oxide/oxygen, a form of conscious sedation that is also known as laughing gas, because it’s a safe and effective way to calm your child’s fears during a dental procedure. Well for one thing, we wouldn’t be using it at Sea Brite Dental if it wasn’t safe! Actually, it’s been around for a long time because it is considered to be the safest dental sedative, even for children. Your child will smell a pleasant scent and feel relaxed and unafraid.